In 2000 John Glaser started the Compass Box Whisky Company, a firm dedicated to blending boutique Scotch Whiskies and making Scotch more approachable and relevant to more people. They are game changers, who have replaced heritage for boldness. 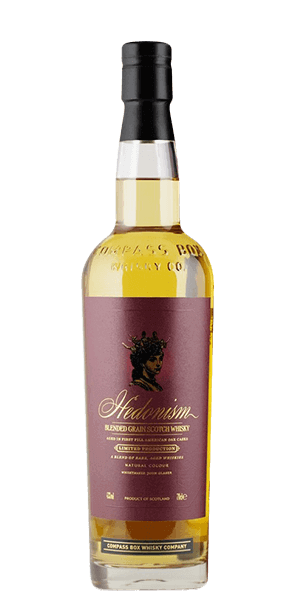 Compass Box Hedonism is one of the Scotch Whiskies in their signature range. It is a blended grain Scotch, produced from 100% grain Whisky (made from mostly wheat, and likely corn as well) sourced from various Scotch distilleries. It is produced only once per year, when they find casks with the right flavor profile, using top-quality single-grain Whiskies aged up to 29 years in first-fill American oak casks. Compass Box blends these grain Whiskies and matures them for an unknown period of time in first-fill American oak casks and rejuvenated American oak Hogsheads. With Hedonism Compass Box challenges the notion that grain Scotch is only meant to be used as a filler in a blended Scotch Whisky, and shows that grain Whisky made properly using great quality oak and long-aged grain Whisky is to be fully appreciated for what it is – soft, complex and understated, with a full and creamy body. The quality of the blend of grain Whiskies is reflected in the price of the Hedonism. What does Compass Box Hedonism taste like? The Flavor Spiral™ shows the most common flavors that you'll taste in Compass Box Hedonism and gives you a chance to have a taste of it before actually tasting it. Sweet dairy cream, fresh yeasty bakery bread, faint citrus (tangerine), vanilla, nutmeg. Whipped cream, toasted coconut, cinnamon, soft wood notes, powdered sugar. It’s ok. Very average. I’d never pay what they list for it. Meh. Aroma’s fine, taste is fine, nothing spectacular. My favorite flaviar thus far. Smooth in the glass. Aroma of strong alcohol and a hint of vanilla. When tasting the flavor explodes in your mouth, a strong vanilla gives way to a oaky caramel finish that brings the perfect warmth to your palate. Leaves you urning for more! Loved it. The taste is spot on with the chart. When I had it neat, it tastes caramel smooth with vanilla and oak. Just let it sit in your mouth and savor it. With some water is fine but not necessary. A bottle is a must. Smooth and delicate...very nice. Not sure I’d spend that kind of money on a bottle though. Loved it and I want more !! Very original and different. Light and easy to sip with intriguing flavors. It’s not as oaky and as stout as the whiskeys I normally enjoy though. Nice discovery. Really good tasting. Perfect to change with peated whisky. Delicate sweet flavor with hints of vanilla and a bit of oak. Not overpowering to the nose and a medium linger. Not much bite to it. Delicious with a nice texture and taste. A good one to have on the shelf for the occasional glass to share with friends. Incredibly smooth. The vanilla topnote overshadowed the smoke, but that’s not a bad thing in my book. It is an outstanding, delicate, Blended Grain Scotch Whisky with a sweet birth, creamy life & silky & warning death. Huge surprise for me. I'm used to smokey scotches. This was great. Full flavor (on the sweeter side). Highly recommend. Excellent scotch. Extremely smooth and full flavored. Very smooth but lacking a bit ..
Great smoothness to the drink but the flavor combinations just weren’t for me. This is quite good - sweet but still whiskey - a good sweet daily drink. Worth a bottle. Overall sweet, with vanilla up front and more fruity citrus towards the end. Hints of wood and spice. Nice for after dinner. Everyone seemed to enjoy the tropical and citrus nose that had minminal alcohol smell. Sweet taste with all the notes above and more if you think hard enough. Slight grain warmth on the back of the tongue while remaining sweet. Good sweet scotch that is great for someone not big on grain burn. The FIRST Scotch Whiskey I've actually liked. Nice sweet blend with a hint of vanilla. Very balanced. Might be too hot for some, but I like it. Good balance of sweet and smoke. Strong cinnamon and grain alcohol aftertaste. Not quite as smooth as I was hoping for, but still not bad. I pick up cinnamon more than any citrus.